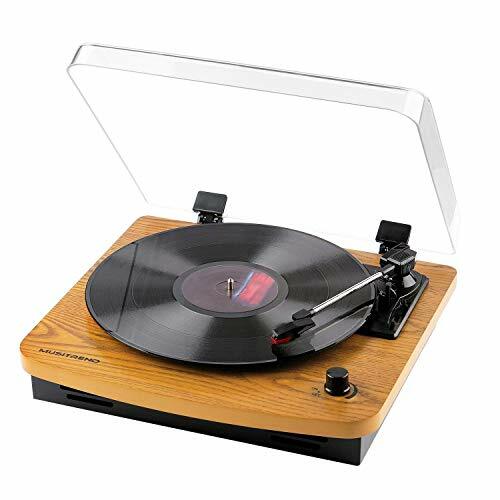 Vintage style: Natural wood record plyer with removable protective dust cover.Dust cover protects your vinyl records for less dust. You can have a 12\" record playing and close the dust cover. 3 Speed Record Player (33 1/3, 45, 78 RPM) + 45RPM Adaptor: Belt driven turntable for 7\", 10\" & 12\" vinyl records. 2 Built-in full range stereo speakers: Built-in 2 x 3W stereo speakers with high sounds quality，RCA audio outputs provide another option for connecting the turntable to your home stereo system and powered speakers for more enjoyable listening experience. Lots of great features for a small portable!